These audio CD singing lessons teach beginners how to sing in a clear, direct and engaging manner. 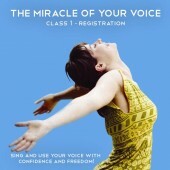 The 3 classes teach the basics of how to sing and use your voice well and with enjoyment. Created by New Zealand singer and singing teacher Barbara Ann Grant, these CDs ares suitable for those with little or no previous singing experience. They are also suitable for those called upon to use their voice in any public setting where the voice must carry with good clear vocal production and support. The classes work to create a non-judgemental space in which you can explore and experience your voice with joy and wonder. If you want to learn how to sing but don’t know where to start – these audio classes are for you! This first CD in these singing lessons covers the basics of good posture for singing and speaking and the registrations of your voice. The intent of this course is to give you a, ‘feeling sense’ of making sound with playfulness and without harsh self-criticism. The first class runs for 40 minutes with an additional 10 minute ‘quick reference’ guided voice practice at the end. The guided practice summarises the key points and exercises on this CD. Devised and created by New Zealand singer and singing teacher Barbara Ann Grant. This third CD in the singing lessons series, ‘The Miracle of Your Voice’, covers how to experience and grow the resonance of your speaking and singing voice. The intent of this course is to give you a, ‘feeling sense’ of making sound with playfulness and without harsh self-criticism. The third class runs for 50 minutes and includes a song study.